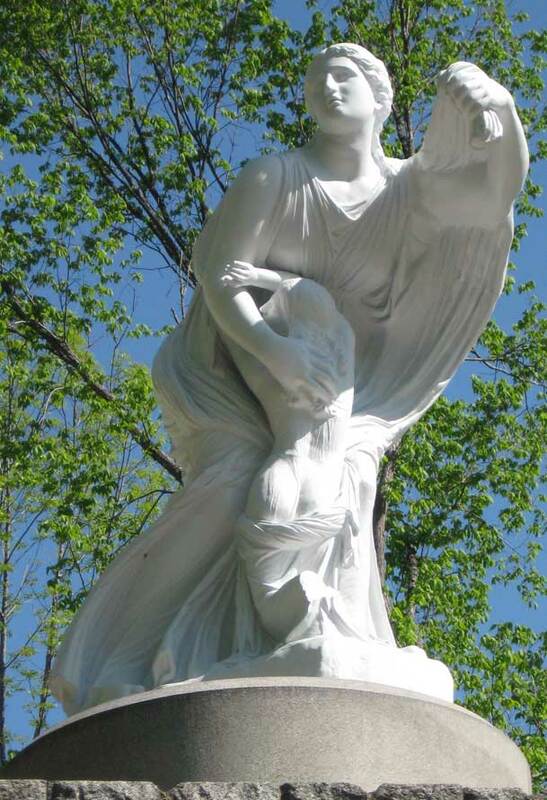 I first heard about the repair of the Niobe statue from Geoff Burrows, our mailman, when he pulled up to our mailbox just as I was returning from a walk down the road. A Sandwich native, Geoff is also the president of the Sandwich Historical Society and a fascinating authority on the town, his knowledge deep. It was an early spring day, bleak but promising. 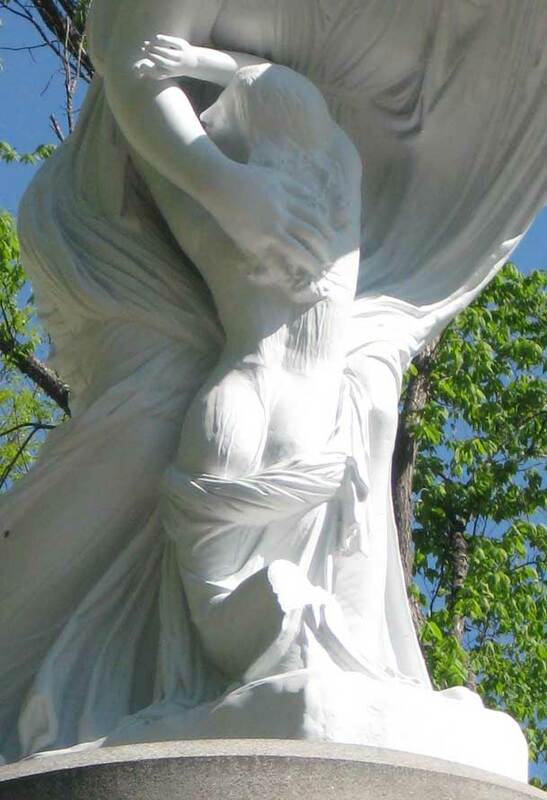 As I stood there learning from him about the historical society’s unveiling event scheduled for true spring, May twelfth, I tried to remember the Niobe myth, but I could only recall children and weeping. S o after I came indoors and wrote the date on the calendar, I looked up the Niobe myth. She was the daughter of King Tantalus and became queen of Thebes when she married Amphion. She and Amphion had fourteen children, seven sons and seven daughters. She was proud of her status and of her children; too proud. On the feast day of the goddess Leto, Niobe boasted about her rank and particularly her fourteen children, scorning Leto as inferior to her because she had only two children. These two children were the sun god Apollo and the moon goddess Artemis (Diana). Leto took revenge for Niobe’s insults: she sent Apollo and Artemis to kill Niobe’s children, which they sure did, slaughtering all fourteen with arrows. Niobe’s husband committed suicide. Niobe was turned into stone, in which state she was doomed to weep forever. I suddenly remembered that I’d seen on the calendar that the day after the Niobe event was Mother’s Day. What a coincidence! May twelfth proved to be the one beautiful sunny day in a long rainy spell, with the delicate chartreuse of the new leaves changing to lush green, and the town turned out in full force. The historical society by then had sent out an announcement about the event, asking us to park in various spots atop Wentworth Hill and to bring lawn chairs. This we all did, and, after milling around and chatting we sat down in the sun on the sloping green lawn of Adams Hall, with the Ossipee Mountains in front of us. Then the present owner of Adams Hall removed a covering to reveal the restored zinc statue of Niobe. Adams Hall is part of the estate that in the 1800s Isaac Adams established when, after leaving Sandwich as a penniless young man to seek his fortune in Boston, he returned rich, having invented a steam-powered printing press. When Isaac Adams had left Sandwich, he left pissed off. He’d needed money to pay his coach fare to Boston but nobody in town would lend it to him because, they told him, he was of “no account” and they’d never get their money back. And that’s why, it’s speculated, he chose a statue of Niobe to adorn the grounds of Adams Hall: he was reminding the townsfolk of the perils of pride, of hubris. And like Leto and Apollo and Artemis he took his revenge. He bought up and tore down his neighbors’ farms, using some of the granite foundations to build what’s now known as the Great Wall of Sandwich around his property. But Mother Nature can take revenge too. After Niobe had stood on her pedestal from 1875 to 1941, she fell during a storm and broke into nearly two hundred pieces. The pieces were saved, albeit in an ignominious place—when Adams Hall was bought by the present owners in 2004, Niobe was found in a barn under a pile of manure. Then in 2010 Adam Nudd-Homeyer, a metal artisan and interim director of the historical society, saw the shattered statue and realized it was made of zinc. As he told the audience at the event, “I thought to myself: I’m a metal worker; it’s made of metal. There’s got to be a way to do this.” And after over four hundred hours of work, he restored Niobe. He spoke about the role of coincidence in all this, from the coincidence of his moving to Sandwich to the coincidence of the statue’s toppling in just the right manner so that her face escaped destruction. The Mother’s Day coincidence again occurred to me. The last speaker was Carol Grissom, Senior Objects Conservator at the Smithsonian and authority on zinc statuary, whom Adam Nudd-Homeyer had consulted during his work. She explained that “zinc always imitated something else.” Sometimes it was painted white to pretend to be marble, as in the case of Niobe, or sometimes it imitated bronze. Niobe was probably cast by Prussian sculptor Moritz Geiss circa 1860, using a plaster mold taken from a statue of Niobe at the Uffizi Gallery in Florence. 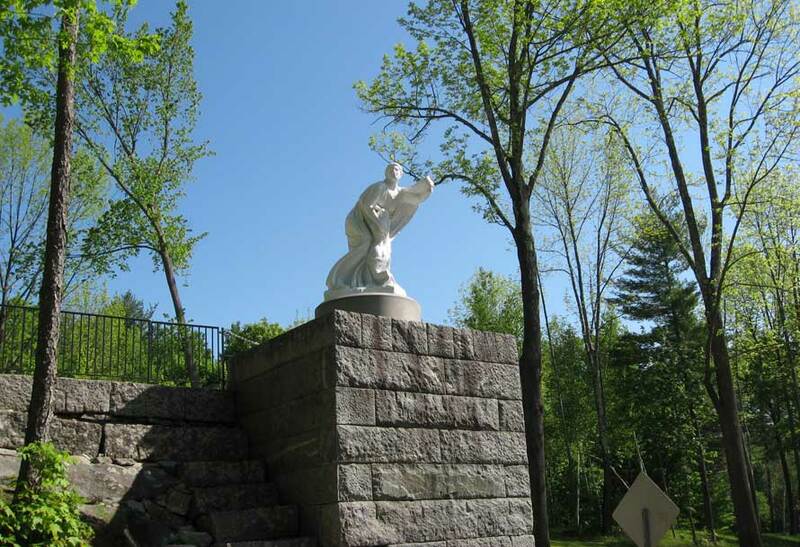 Since the event, Don and I find ourselves detouring onto Little Pond Road to drive down the hill to see the statue. With Niobe once again standing here, it definitely can be called “Image Hill” again.